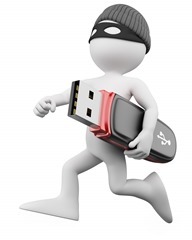 Can employee theft be a protected activity? Unfortunately, yes. As I’ve written previously, employee theft of data and documents is so common it’s frightening-or should be-to any employer. See Your Employees Are Stealing Your Data; Your Employees Are (Still) Stealing Your Data. When an employer discovers that a recently separated employee has taken with him or her the employer’s data in electronic and/or paper format, there are a few possible outcomes. Frequently, legal counsel is able to get the documents returned and an affidavit signed by the employee certifying that he no longer has any of the employer’s property in his possession, custody, or control, and that, should he later discover that he does still have such property, that he will contact the employer immediately and cooperate fully in returning it. In these cases, it is up to the employer whether or not to “go after” the documents (and/or the employee who stole them). But this is not always the case. Employees have stolen the employer’s documents only to then attempt to use those documents in litigation against the employer. Yes, this is as horrible as it sounds. Here’s the nightmarish scenario. Employee sues employer, alleging that employee was subject to unlawful discrimination based on age. While still employed, employee steals a copy of her personnel file and the personnel file of the younger co-worker who employee claims was promoted instead of employee. During discovery in the litigation, employee produces copies of these stolen documents and claims that they support her age-discrimination claim. You now know that the employee wrongfully accessed the co-worker’s (confidential) personnel file, made a copy of it, and retained that copy (presumably giving a copy to her lawyer, who then produced it to you during discovery). The rational employer would likely respond to this information by terminating (or at least wanting to terminate) the employee for breaching all sorts of policies. And, if the file contained certain personal data, the employer would likely have a legal duty to notify the affected co-worker, as well. But, alas, the law is never as obvious as one may hope. There is a small body of cases that held that problems can arise if the employer does what most rational employers would want to do-i.e., fire the thief-employee. For example, in a 2010 decision, the New Jersey Supreme Court held that it was, in fact, unlawful to terminate the employee for precisely the conduct described above. The court found that the employee gave the documents only to her lawyers, that the documents were directly relevant to the employee’s claim of discrimination, that the disclosure of the documents did not threaten the company’s operations, and the employee had a reasonable basis to believe that the documents would not have been produced during discovery. Quinlan v. Curtiss-Wright Corp., 204 N.J. 239 (2010). Ugh. I should hope that it goes without saying but, wow, that is disturbing. [W]e are loathe to provide employees an incentive to rifle through confidential files looking for evidence that might come in handy in later litigation. The opposition clause protects reasonable attempts to contest an employer’s discriminatory practices; it is not an insurance policy, a license to flaunt company rules or an invitation to dishonest behavior. O’Day v. McDonnell Douglas Helicopter Co., 79 F.3d 756 (9th Cir. 1996). The Ninth Circuit is not alone in rejecting the idea that an employee’s theft should be endorsed by the courts. The Sixth Circuit reached a similar result in Niswander v. Cincinnati Ins. Co., 529 F.3d 714, 718 (6th Cir. 2008). Nevertheless, if you thought that your employees could not use stolen information against you, you may want to think again. And then think about whether you have solid confidentiality and privacy policies in place. More and more employers require employees to sign a confidentiality agreement every year. And, with cases like Quinlan, this idea seems to be a prudent one.